The B90B ... entry-level model. More than 800 exhibitors are expected to participate at Bauma Conexpo Africa 2015 to be held next month (September 15 to 18) in South Africa. The second edition of the international trade fair for construction machinery, building material machines, mining machines and construction vehicles, will be held on 80,000 sq m of exhibition space at the Johannesburg Expo Centre and is expected to attract 20,000 visitors. Among the leading construction brands that will be showcased at the expo will be New Holland Construction, which in collaboration with its South African distributor MB Plant, will present a line-up of innovative equipment solutions. “The construction sector holds significant growth potential in the Maghreb and Sub-Saharan Africa, where South Africa remains a key market,” said Andy Blandford, vice-president CNH Industrial Construction Equipment for Europe, Africa and the Middle East. 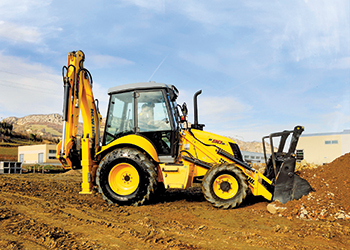 New Holland Construction, a brand of CNH Industrial, said the spotlight will be on its backhoe loaders and skid-steer loaders. Two entry-level 97hp B90B backhoe loaders will be on display at the event. Combining the power of a wheel loader with the performance of an excavator, the versatility and compact size of these machines make them the ideal solution for a wide variety of applications, the company said. Also promoted will be its 200 Series skid-steer loaders, which are said to deliver high performance and manoeuvrability in a compact size and a W190C wheel loader, designed to give the biggest bucket payload in the industry. The company will also showcase its heavy-duty C Series of crawler excavators with a 23-tonne E215C unit and the top-of-the-range F200B motor grader.